An experienced team of UK-based bloggers and authors of M/M Romance has arranged an Author Signing event for this genre. For those who are not familiar with what shiMMer is all about, can you give us a little more information? 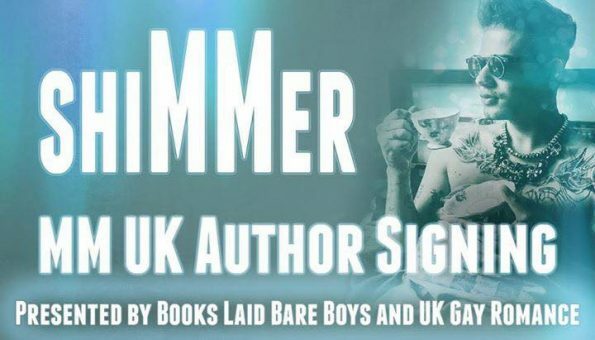 ShiMMer will be the first major MM author signing that is purely about connecting authors and readers and hopefully promoting sales and readership. Our aim is to make the day fun, inclusive and for everyone to enjoy each other’s company in a safe environment. It will be a relaxed, friendly and sociable affair and hopefully the first in many more MM signings in the future. We have been to lots of MF signings and we thought it was about time MM had one of its own! How about introducing yourself, and giving us a little background about what each of you do in the world of books, and how you all met? There are 5 of us on the shiMMer Team. So on the shiMMer promo you can see it is being organized by two blogs. First we have Books Laid Bare Boys which is made up of the founder, Suzanne and Fiona who is fabulous at reviewing. Then we have UK Gay Romance which is Sue who is also a very successful MM author. Claire is the genius behind the website and admin side of things. She is also an amazing MM author. Carol is our logisitical expert and runs her very own blog. Suzanne, Fiona and Sue are mainly responsible for promo and connecting with blogs, readers and authors. It is very much a team effort and the thing that binds us is our love for reading and books. All of us are avid readers, reviewer and advocates of MM and together we all wanted to give MM authors another platform to boost their work. What was your motivation behind planning shiMMer? Is there something more than getting a book signed, or meeting a fan, that you hope readers, and author’s alike gain from attending this event? You only have to go on Facebook and into the MM groups to know how much passion there is both on and off the pages of the authors’ books. MM fans are madly loyal and supportive of their authors and there is so much love for the genre that we thought if we can bring that to life for a day it would be amazing. Between us we have attended signings, author events, MM meets and the like but nothing on this scale that is purely for authors to promote themselves. I see that your website indicates you welcome sponsors. How can someone sign-up to support you? Is anyone welcome to sponsor you, bloggers, readers, authors….even those who may not be attending but want to support something very positive for our book community? It only costs £10 to sponsor an author. Sue Brown has all the details and is contactable through the website. There are also more details about sponsorship on there. Anyone is welcome to sponsor and we have a few people who sadly can’t attend due to other commitments who have welcomed sponsorship as a way of still supporting the event. Where can authors register and how can readers obtain tickets? What is the cost? The ticket price is £25. That gets you through the door and into the wonderful world of shiMMer. We plan on holding a raffle. Tickets will be £5 and there will be one mega prize of a heap of wonderful stuff that is growing by the day! Raffle sales are all for charity. It’s an 18+ event because some of our authors write quite naughty stuff and we don’t want anyone holding back and worrying that their conversations might be inappropriate! The venue is stunning – look it up, it’s the Holte Suite at Aston Villa Footbal Club. We chose it because there’s loads of free parking; it’s right by the station: ten minutes form Birmingham City Centre, and also in the middle of the country. The hall is quite lavish and the toilets are fab! Some of us are staying in Birmingham overnight and will be partying post shiMMer but there is no formal event organized. This event looks amazing Sean! I encourage anyone who can to attend, to get their tickets!! !